Some guys can't catch a break and others have too many. That's what Hubby found out this morning when he hit the bucket garden with his truck. His truck is fine. The bucket garden is not. To fully understand what the garden means (oops, meant) to Wifey you would have to know the full situation. A job transfer six weeks ago relocated the once happy family. 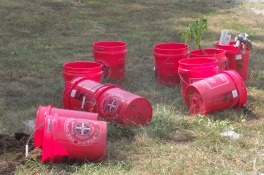 The bucket garden was cheerfully transported to the new home along with various other belongings. Once there, Wifey thought the bucket garden was carefully placed where it could receive adequate amounts of sunshine, rain and TLC. Little did she know that her hopes would soon be dashed to the ground. At this point Wifey would like to add one minor detail. This is the first bucket garden she owned that actually produced vegetables. Now it seems that the work may have been a one hit wonder. Poor Hubby. He was already in the doghouse but now grass has been added to the picture. It may be a new trend in going green. 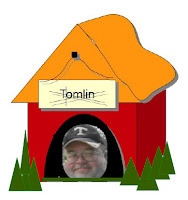 Will Hubby make it out of the safety of the doghouse? Will the car or bucket garden be fixed? Time will tell and if it doesn't this blog will. How did he manage to run over the buckets? You'd think he would be more careful after the PT Cruiser incident.